Aan de Vliet - Hazyview Accommodation. 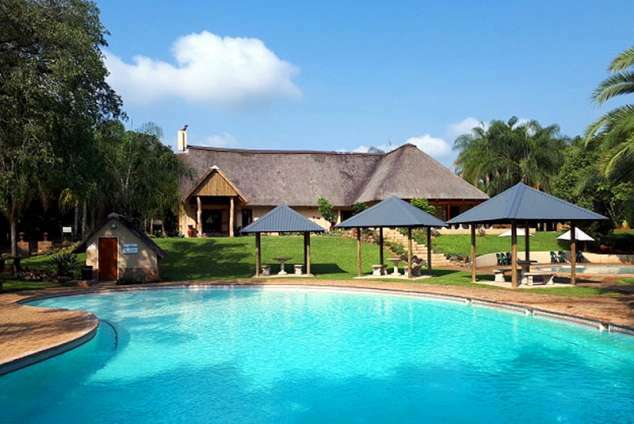 AAN DE VLIET HOLIDAY RESORT is situated 8 kms from Hazyview, and a mere 20 kms from the KRUGER NATIONAL PARK, in the Mpumalanga Province of South Africa. The resort is ideally located at the heart of the scenic Panorama Route in Mpumalanga. There are 8 self catering STREAM UNITS available, suitable for a couple. Please note, there are no TVs in the units.The Riverside Centre has lounges with DSTV. There are 14 self catering RIVER UNITS available, suitable for 4 - 5 guests. Main bedroom with one double bed and two single built in beds in living area. There are 22 self catering GARDEN UNITS available, suitable for 4 - 5 guests. The Reception and the Administrative offices are situated at the MAIN BUILDING. There is also a large seating area with WIFI. The Breakfast Room is adjacent to the Reception. Breakfast is served there daily. The RIVERSIDE CENTRE has a unique indoor bush pub and a lounge with DSTV. The adjoining lounge has a pool table and a magnificent view over the Sabie River. There are 2 halls available for functions and reception. The smaller venue can easily accommodate 50 guests and the big hall up to 150. The River Lapa is on the banks of the Sabie River, it has braai facilities and is suitable for 50 guests. A convenient shop for braai wood, ice-cream and cold drinks. Between the Main Building and the Riverside Centre is a large and a toddler’s pool. A jungle gym, trampoline, swing-set and sand pit will keep the little ones busy. The tranquility of the Sabie riverfront forms the perfect background for a picnic or a sundowner. Explore the famous Panorama Route, where you’ll encounter sky, forests and the truly impressive Blyde River Canyon, the world’s largest green canyon. Giant potholes, God’s Window and awe-inspiring waterfalls are all just a short drive away. 20 km from AAN DE VLIET you’ll find the Phabeni Gate entrance to the Kruger National Park, host of the famous African Big 5. You can explore the Park on your own or arrange with a Tour operator to go on a safari with a game viewing vehicle. The nearby rustic town of Pilgrim’s Rest gives you the chance to relive the 1873 gold rush. There are lots of action-packed things to do nearby. Golf courses, River rafting, Sky trails, Quad biking and Elephant walks are just a few activities on the list. Detail description : Aan de Vliet is situated at the heart of the Panorama Route and a mere 18km's from the Kruger National PArk. 943 page views since 02 Oct, 2018. Last updated on 09 Oct, 2018.